· The grand viewfinder provides excellent coverage and is a pleasure to use underwater. · The housing appears to be durable and is relatively compact with the camera fitting very snugly. · The housing's Teflon coated anodised, milled aluminium offers good scratch resistant protection on the outside and looks good. · Controls have a positive feel and are easy to use with gloved hands. · Handgrips feel to be in the right position for shutter release and control. · It is possible to remove the camera's memory card without needing to unscrew and remove the camera from the housing tray. · It is also possible to switch lenses from the front of the housing through the port opening while the camera remains mounted in the housing. For lenses with zoom gears, using a lens removal tool may be used to access the camera’s lens release button. 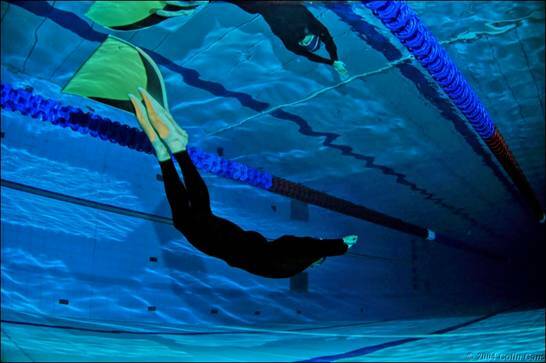 · The tubular strobe arms are hollow increasing buoyancy and reducing dry weight. The arm clamps are well designed and have a good bite on the standard 25mm balls. The T piece screw clamps allow fast removal of the complete arms from the housing and also easily secure these without any noticeable play. The 25mm balls can accommodate the arms of other manufacturers such as Ultralite. · Three mounts are provided for attaching strobe arms, one on the left side of the housing and two on the housing handles. This arrangement is very useful for wideangle work although replacing the on-housing T piece with a lower profile 25mm ball proved to be a better fit. · Lens port construction is a combination of optical glass bonded to durable, high strength machined plastic barrel utilising a bayonet style fitting with an O’ring seal on the port barrel and are easily installed. · Both 18-70mm kit lens and 60mm macro lens can be accommodated in either a dome port, DOM106 or the PN94 flat port. The 18-70mm lens in the dome port requires a #2 close up diopter. · The same wideangle 180F dome port is used for the 10.5mm fisheye and Sigma 15mm fisheye lenses. It may also be used with the Nikor DX 12-24mm lens by inserting a 28mm extension ring. A zoom gear for this lens would be required. · Basic installation instructions were supplied in English and were easy to follow. · One area of concern was that no silicone grease was supplied for the o’rings; however, Sealux did take the trouble to supply an unlabeled pump bottle with lubricant. I later discovered upon asking them that this lubricant was for cleaning the housing. Upon requesting silicone grease they obliged along with replacement o’rings. · I would have felt more comfortable with more detailed documentation and this is certainly an area which I feel that Sealux could improve upon. 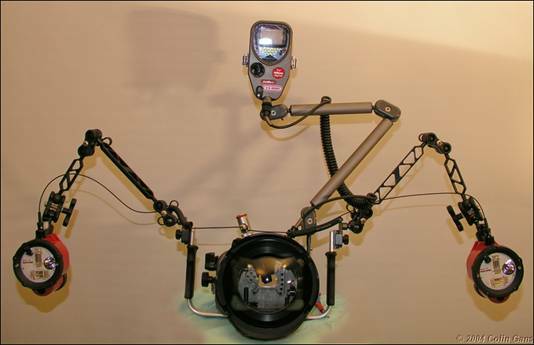 · Once correctly aligned the camera fits snugly on its supports and is held in place on a base plate with a single tripod mount screw. Sealux recommends removing the storage card until the camera is correctly mounted on the base plate. · It is important to ensure that the camera is powered on and that the housing power switch lever is also correctly aligned by placing in the on position before inserting the camera into the front half of the housing for mounting. It is also important to ensure that the AF/MF lever is pulled out. · I found that with the certain combinations of strobes the internal speedlight attempts to pop up when the flash options lever is pushed. To avoid this occurring after the housing has been sealed a small length of tubular insulation foam placed around the hotshoe connector cable and wedged between the speedlight and the inside of the housing wall will stop the speedlight from opening. · The moisture alarm can be easily tested by applying a moistened finger to the exposed contacts prior to installing the camera. · The grand viewfinder is exceptional and overcomes my concerns with the smaller D70 viewfinder. · Shutter trigger lever – good positive tensile feel with sufficient feedback on the half press to activate autofocus and metering. · Lens zoom gear works well on 18-70mm lens with DOM106 port; this lens can still be removed from the front of the housing by removing the port if a lens removal tool is used. I use a small Allen key covered with plastic tubing as a lens removal tool. · The handgrips appear to be perfectly located giving good balance and leverage for aperture, shutter trigger and zoom controls. 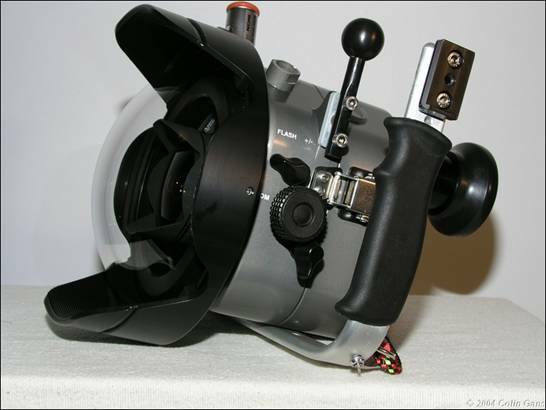 · Aperture and shutter speed dials work well with good tensile feel in the water. · AF/MF lever is superfluous on most lenses barring the longer micro lenses such as the 105mm or 200mm Nikkor and care needs to be taken to ensure that this lever is not accidentally switched to manual. · Removing the memory card and inserting the USB cable can both be done while the camera remains mounted in the front half of the housing housing. · Internals such as o’rings and hexagon screws are of standard size and thus easily replaced if required. 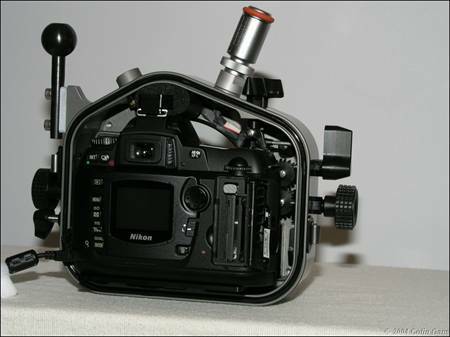 · The camera did not initially seat correctly on the housing baseplate. This was due to a faulty circlip and insufficient tolerance on the camera support shafts. The circlip was replaced with a new one and has caused no further problems once installed. · The camera power switch initially functioned only intermittently due to alignment of the U lever. This was adjusted and has caused no further problems. · The Metering Mode and Exposure Compensation buttons would activate only intermittently. This turned out to be more of a challenge. Rather than return the housing, I opted to resolve the problem myself and extended each prong on the U lever using heat shrink cable. 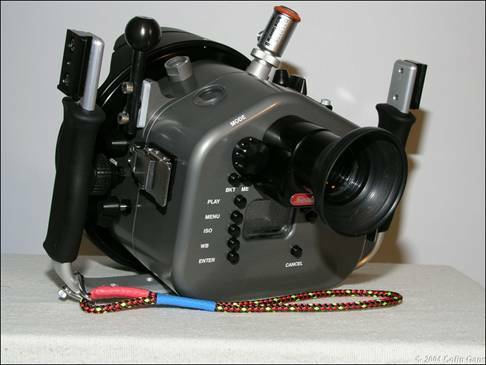 · The Nikonos style strobe port did not function due to a disconnected wiring pin. After identifying the problem this was resolved by correctly inserting the active pin in its socket. · I believe that all of the above problems can be attributed to inadequate pre-despatch testing. This may have been due to the fact that the housing was promised to me by the end of August and had been delayed somewhat beyond the usual 3 week wait because of the German summer holiday. Hindsight tells me not to order a housing just before the German summer holidays! · As can be expected, the SB800 functions very well underwater in iTTL mode for macro work. 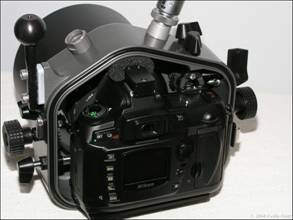 · The zoom head adjustment buttons are unavailable on the housing as is the centre setup button. Whether this is a major drawback or not, time and use will tell. My initial thoughts are that for underwater use, these buttons are redundant. · If used in conjunction with another strobe such as the Ikelite DS-50, the SB800 must be set to manual or automatic rather than iTTL in order to trigger the slave on main flash rather than pre-flash. · My personal preference was to use my two existing Inon DS180 strobes as well as the Nikon SB800: all three together for extreme wideangle and the D180 strobes independently for mobility. 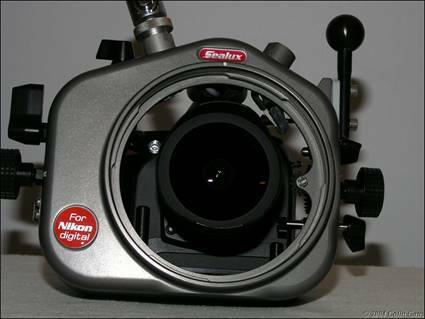 The Inon optical converter did not function on the factory standard pin configuration of the Nikonos style port. It turns out that using the standard five pin configuration in the Nikonos style port rather than just having two pins wired allows use of dual Inon D180 strobes in combination with the SB800. A three strobe setup is very useful for extreme wideangle lenses such as the Nikkor 10.5mm fisheye. Telephone support was good and provided in spoken English. During the initial assembly issues, Jurgen at Sealux was extremely helpful and when it came to getting the Inon strobe to work they undertook their own testing before despatching the differently wired Nikonos port. I should also add that Inon were also very helpful in providing the correct pin configuration for their product to work. A functional comparison with other vendor D70 housing offerings is beyond the scope of this review suffice to say that I considered compactness, the availability of ports and a good solution to the viewfinder problem to be of high importance in my choice. Cost also obviously came into my decision and I found the Sealux CD70 to be less expensive than some other milled aluminium offerings. All in all I am very pleased with the CD70 and can see myself getting years of use from this professional level housing. The quality in results gained in using a digital SLR camera over a prosumer ‘point and shoot’ model comes at a cost both financially and in terms of extra weight top-side; however, I believe the benefits outweigh the disadvantages for anyone serious about underwater photography.